2. ANATOLIAN STUDIES. Vol. I (1951) to Vol. 40 (1990). Journal of the British Institute of Archaeology at Ankara. 40 vol. in-8 softcover many ill. maps photogr. + 1 Index to vol. I-X (1951-60). Table of contents : Archaeology Middle East Studies Social Sciences Area Studies.Little missing on cover of the vol.1 otherwise very good condition of this set. ¶ Rare head of this collection. 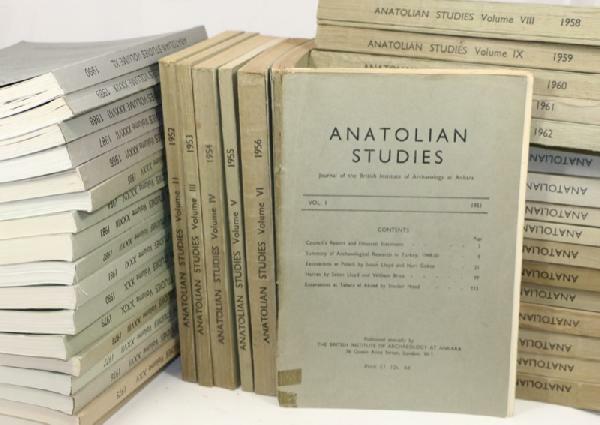 Anatolian Studies is the annual journal of the British Institute at Ankara. It contains articles focused on Turkey and the Black Sea littoral in all academic disciplines within the arts humanities social sciences and environmental sciences as related to human occupation and history. Articles are in English and are accessible to a wide academic readership. Anatolian Studies is a refereed journal.